Your hair is an extension of yourself. Whether it's having a fun night on the town, partying it up at a concert or attending a classy event, bring out the best in your hair. For all of life's occasions, the JATAI Teasing Pin comb takes your hair to the next level! With one comb, comes volumes of possibilities! The JATAI Teasing Pin Comb is perfect for teasing, backcombing and detangling. It's thermal resistant, has an ABS resin handle, and features rust resistant pins. The pins are 100% Japanese stainless steel and the comb is anti-static. The comb is built to last with solid, durable pins that don't scratch your scalp or break hairs. It's gentle and easy to use. 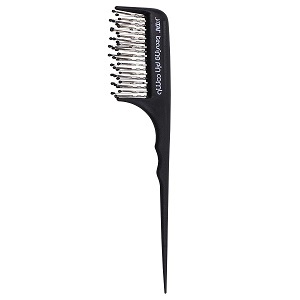 Get volume and lift with the JATAI Teasing Pin Comb! For best results, use in a circular motion from top to bottom.